Images from Burma, where car enthusiasts are taking to the roads in a bid to save the country's ageing classic cars from being consigned to the scrapheap. A group of classic car enthusiasts on Monday began a trip around Burma - also known as Myanmar - in an event which organisers hope will help save some of the country's ageing but less prestigious vehicles from being consigned to the scrapheap. 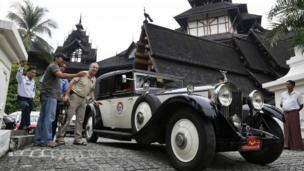 Twenty cars, including these made by Mercedes-Benz, Rolls-Royce and Chevrolet, left Rangoon on a two-week, 1,429km (889 mile) journey that will take them to Inle Lake, the ancient temple city of Baganm and Ngapali Beach. The Burma Road Classic is thought to be one of the first of its kind in the country. 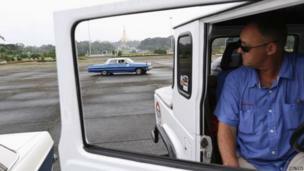 Nine of the vehicles are owned by foreigners and have been shipped over especially for the rally. 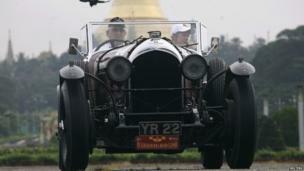 The 11 other cars taking part are kept in Burma. Organisers say it is important to preserve the handful of classic cars in Burma because many are part of the country's history - having rattled along its famously pot-holed and fumed-filled roads for several decades. 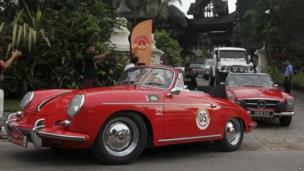 Myanmar Classic Cars Club spokesman Zaw Phyo Linn said the aim of the rally was to remind people that "classic cars should be valued" and to encourage owners not to destroy them. 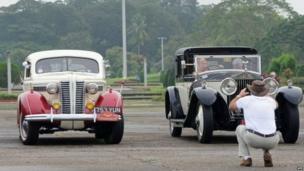 Under military rule, imported cars were a luxury reserved for people close to the government. But correspondents say that the authorities have in recent months allowed owners of ageing cars to trade them in for sought-after permits to buy imported used vehicles.